I am one of those people that has occasionally marked the story of my life on my body. I’m not a crazy piercing/tattoo/modification person, but I do hit places in my life where it seems fitting. It’s been a while and last year was one of those times. And so now I have a new tattoo. That brings me to two piercings and two tattoos. It’ll be a long while before the next, if I ever do it again that is. It takes some extreme inner turmoil to make me record it so permanently, and I hope that doesn’t happen often in my future. I was 20 years old when I came out to myself and the world. That’s when I pierced my nose. A few years later, at 24, I had an intense year of exploration and my first time living overseas (Paris). I stayed with the piercing theme and got my belly done. It infected like a demon but I healed and kept it. I toyed with getting other piercings after that but nothing drew me strongly enough and I figured I was done with my young, crazy phase of life. At 27 though, I lived through and eventually managed to end a very abusive relationship that terrified me like nothing else had. This time a piercing didn’t seem to fit. I wanted to have a clear visual reminder to myself to never, never, never let that happen again. I have a small tattoo of two bears on the front of my right shoulder, one inside the other. On the front, so that every time I look in the mirror I see it looking back at me. When I was little my family nickname was Pooh Bear, after Winnie-the-Pooh. It took me a long time to grow out of it (big brothers can be so annoying) but I still feel great affection for the name and the child it represents. When I was older and spending a lot of my time in the wilds, camping and climbing, a good friend nicknamed me Grizzly Addi, after Grizzly Adams. This was the strong, grown, competent bear of me. These are the two bears in the tattoo. A reminder that Grizzly Addi needs to care for and protect Pooh Bear. I am my own protector, and no one else can do the job that I can and should. So, 11 years later, this leads me to the new tat. The past year has been a horrendous year for me in many ways. For the first time in a long time I felt the strong urge to mark it, but I couldn’t figure out what it should be. I kept rifling through symbols and images in my mind. I just couldn’t seem to settle on what the “point” of it was to be. I finally saw the year having been full of confusion, self-doubt and feeling overwhelmingly lost in my own skin. I’ve lost all sense of who I am and where I’m going or why. I am on a new journey now, both physically around the globe as well as within my innerspace. This tattoo is about finding direction and being willing to openly explore uncharted territory with only my wits about me. 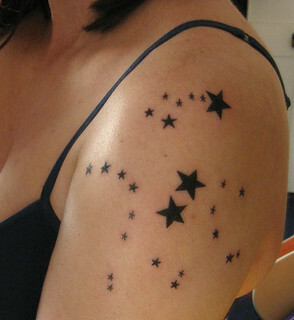 The tattoo may not be immediately clear except to those that know their stars. It is of the constellations Ursa minor and major (Little and Big Bear), more commonly known for their asterisms, the Little and Big Dippers. Two bears, a big one and a little one. The Big Bear has the pointer stars, Merak and Dubhe, which help find the North Star, Polaris, in the Little Bear. Together they give orientation; a way to sort out where you are, where you may be heading and maybe even a path to home, wherever home may turn out to be for me.